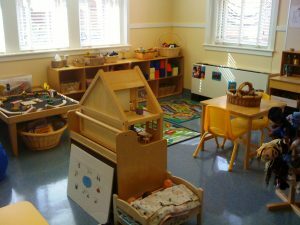 Help create a Sensory Room at the Circle Preschool! SCAN’s Circle Preschool has identified a critical need for a Sensory Room dedicated primarily to the sensory regulation needs of young children. This has become an integral and urgent need at our preschool, however, supporters like you are needed to help make it possible! Space at St. James Children’s Center is available to create the room, which all children at St. James will be able to use. The Sensory Room would be a separate room at the St. James Children Center where children from our preschool (and other classrooms) can go when they need to deregulate. The room aids the child in several ways including providing a safe space to regulate and teach the child about their own sensory experiences and how to use the environment (the room, the equipment in the room) to promote calming and safer expressions of feelings. A sensory room allows for the use of visual, auditory, tactile and gustatory sensations as potential tools to promote self-regulation. The room will include padded mats for extensive and safe movement such as jumping, running, climbing, crashing, and swinging. It will also have age appropriate weighted materials available to the child- again who would use to promote sensory motor regulation. The room would include specific tools which promote regulation through tactile, visual, auditory domains such as play dough or clay, objects which demonstrate differing tactile sensations, music, drums, specially programmed music, aromatherapy materials. Our sensory room will also include at least one rocking chair for staff and children to use- again promoting regulation through modeling and vestibular input. Our goals is $5,000 to fully fund this room that will make such a difference for a child! Thanks to generous contributions from individuals, we are currently 72% of the way to our goal. Donate now and Help a Child Today!